I have never made a red velvet cake before. When I saw this post at the blog Sprinkle Bakes, I had to try one. Originally, I had planned on making a heart-shaped cake as she did, but decided to leave it round. 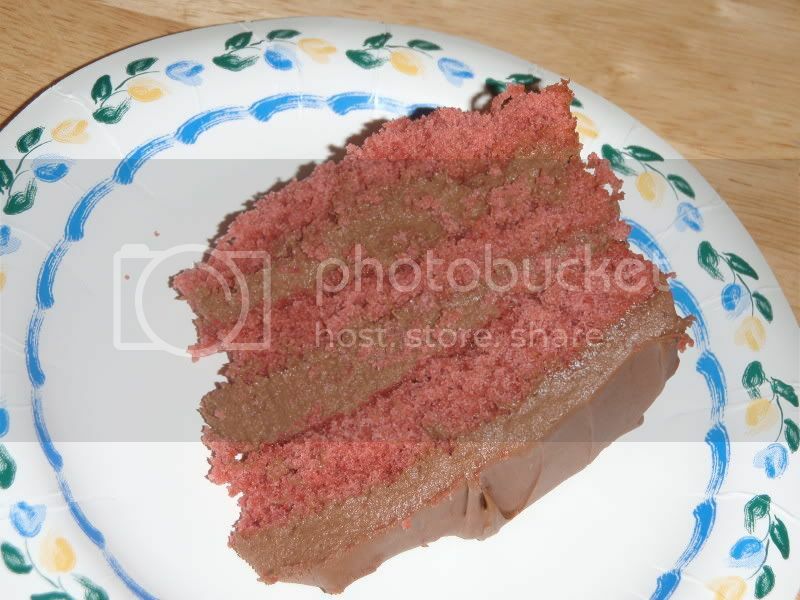 I was about 2 tsp short in red food coloring, so my cake turned out a bit more pink than red. On the whole, this cake was super easy and fun to make, although it turned out a bit too sweet. I think it was my icing's fault. I did not follow the recipe suggested as I wanted chocolate icing. Perhaps next time I will fill the layers with a marscapone icing (rather than cream cheese and butter) or lessen the sugar in the cake. Either way, it's a gorgeous cake that I would try again. Preheat oven to 350 degrees. Spritz 3 round 9" cake pans. Whisk or sift together flour and sugar. Set aside. If not using buttermilk, prepare milk and allow to sit a couple minutes. In a large bowl cream together butter and sugar until light and fluffy. Add eggs, one at a time, beating well after each addition. Add flour to butter mixture, alternating with buttermilk, and ending with flour. Mix well after each addition. Add vanilla. In a small bowl, mix together cocoa powder and food coloring until a paste forms. 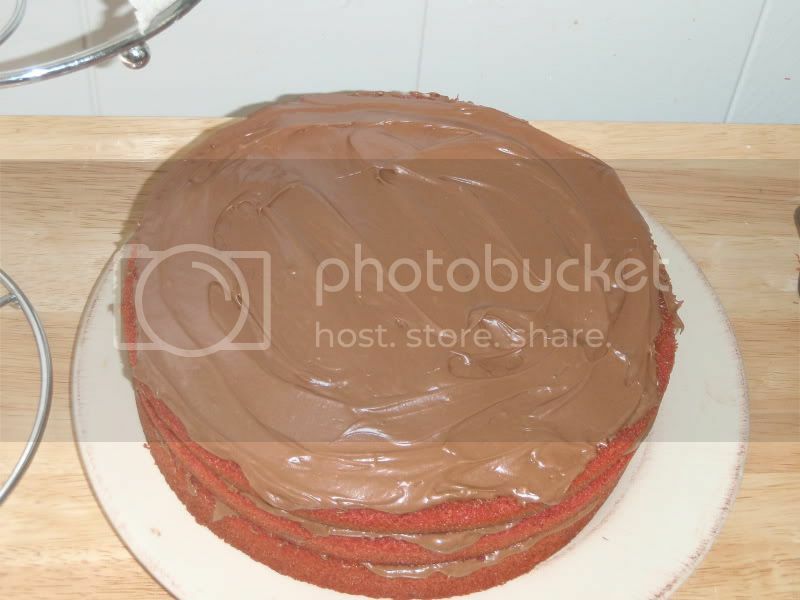 Stir into butter mixture until you have a lovely red color throughout. In a small bowl, combine cider vinegar and baking soda. This will foam. Add immediately to batter. Divide batter among three baking pans. Tap each pan on the counter to eliminate air bubbles. Bake for 25-30 minutes until cake is springy. 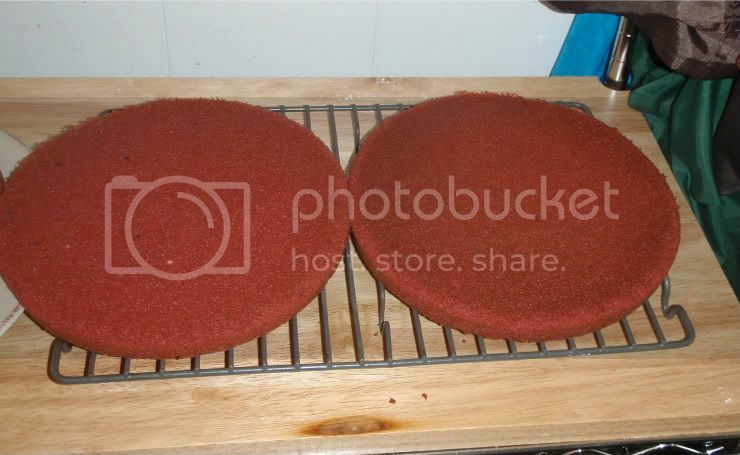 Remove cakes from pan and cool completely on a wire rack. 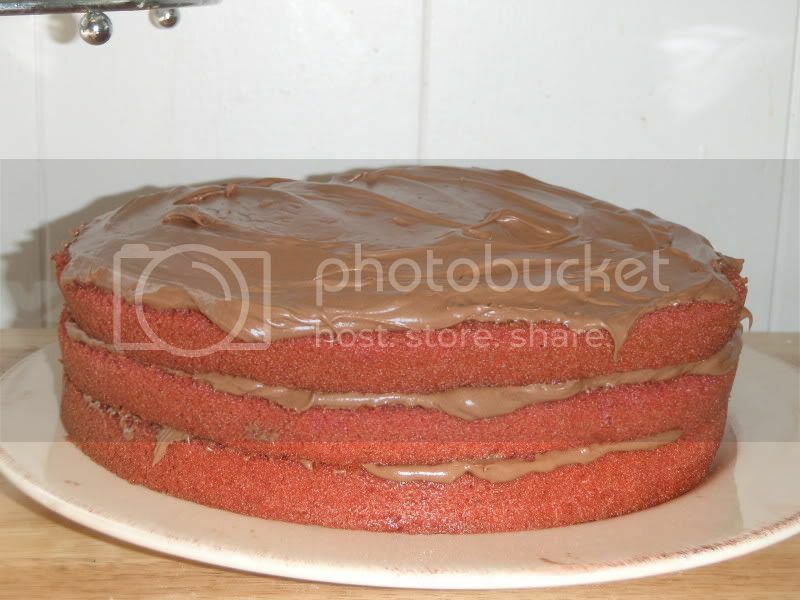 Using a mixture, beat together frosting ingredients. Add a splash of milk if too thick. 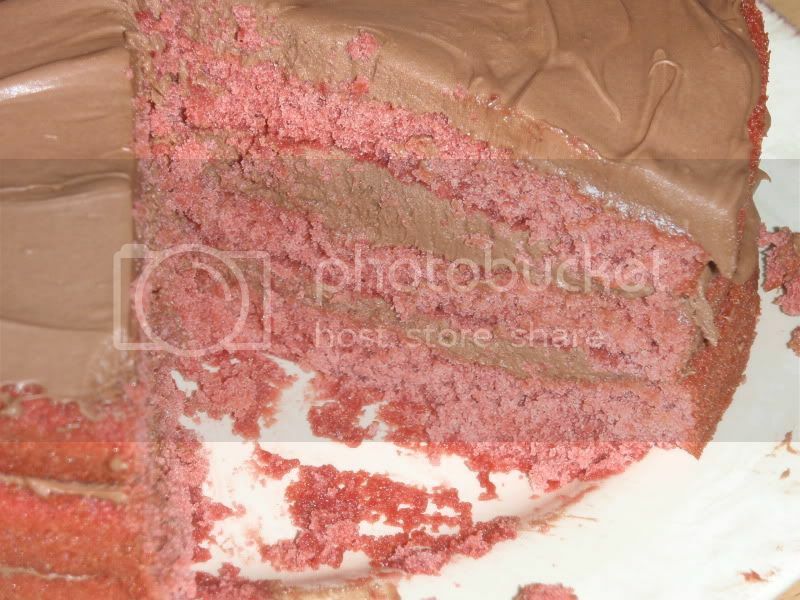 Frost cake as desired.I like a lot of frosting between my layers, although you could do a thin layer and then frost the entire cake.